Use SalesProTM to send a single advertising e-mail on the fly, or thousands at once. Its marketing database and profiling makes easy work of highly focused niche campaigns that produce far higher response rates than their more broadly based counterparts. With SalesPro, you no longer have to settle for random e-mail templates that don’t match your website or your marketing literature. E-mail created within SalesPro can be enclosed in pre-formatted graphical pages that match the design of your website, or they can be enclosed as plain text in an unformatted template that easily cruises through spam filters. Create e-mail content on the fly or modify content you have previously saved using the included Content ManagerTM for SalesPro. You can add images, trackable SmartLinksTM, and a wide range of advanced formatting options. SalesPro’s powerful mail merge capability allows you to personalize each e-mail using almost any information about the prospect or her company contained in your marketing database. In addition to managing the content of your e-mail promotions, Content Manager can be used to update your landing page or website to coordinate with your promotional programs. Then, when you get an idea for a campaign on the way into work, you can have it in front of your prospects by the time you finish your morning coffee. A website lead form can automatically insert leads into SalesPro’s marketing database. SalesPro allows you to capture leads from website visitors, marketing e-mails, postal campaigns, print and other traditional advertising, pay-per-click ads and on-line display ads in a variety of ways. With trackable SmartLinksTM, you can determine which individuals click through from your marketing e-mails with no further action on the part of the prospect. 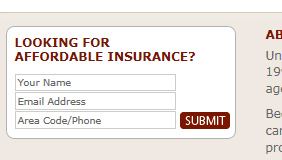 You can include a blank form or formlet on your website or a landing page for prospect inquiries. Or, you can generate forms that are pre-populated with the prospect’s information when they open a marketing e-mail, or enter their ‘keycode’ from a postal mailing. Regardless of the way you handle leads, SalesPro will automatically add them to your marketing database. You can then provide electronic download of the ‘offer’ (such as a booklet or white paper), and route the lead to the appropriate sales rep for follow-up.